One year ago I visited family in Indiana. 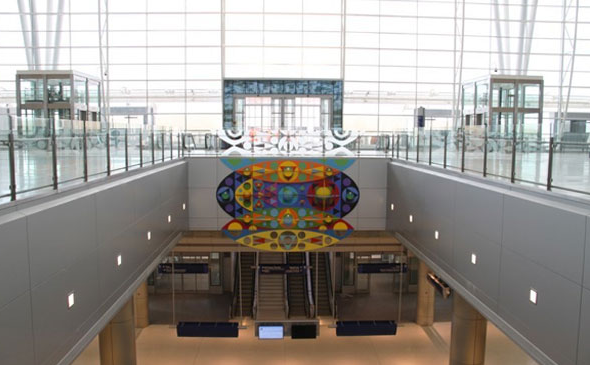 Strolling from the plane to the baggage claim, I admired the Weir Cook Terminal at the new Indianapolis International Airport. I thoroughly enjoyed the architecture, the open spaces and the great environment that had been created. It was functional yet beautiful. Nice! Job well done! But above all, I was thrilled to see the artwork that was included at key locations. A commitment to the arts has always been a sign of civility and appreciation. It speaks of broader perspectives—leadership and vision. The Arts bring a much needed reflective quality, a sense of playfulness or a nudge of provocation—while they speak of the unseen currents that animate our lives. Powerful stuff! At that time, despite the beauty of the grand new facility, a controversy was raging. 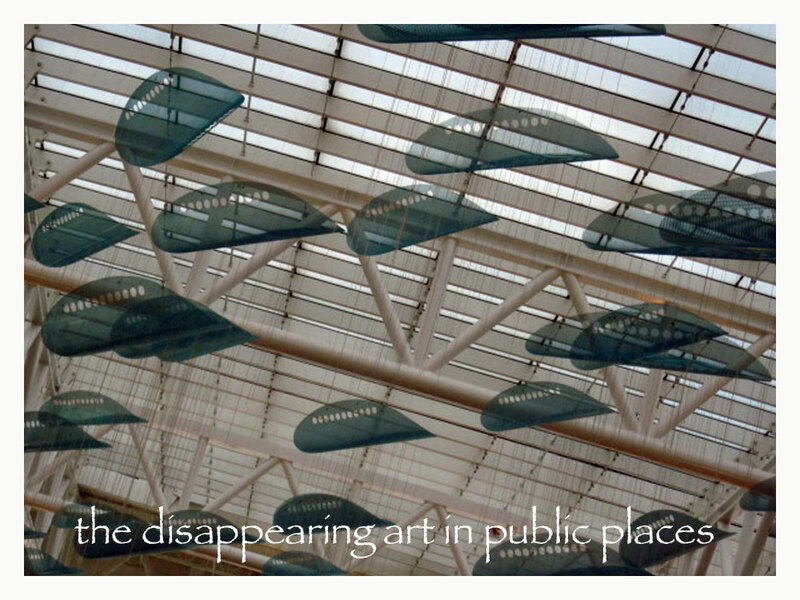 The airport administration wanted to remove the specially designed sculptural centerpiece by the artist James Wille Faust, and replace it with advertising. What? You heard me right. That special location by the main entrance and bank of escalators had been determined (shortly after the commission and installation of the sculpture) to be prime real estate for a giant LED advertising screen that would bring in hundreds of thousands of revenue dollars every year. That fact alone, should scare the bejeezus out of us. Think about it. 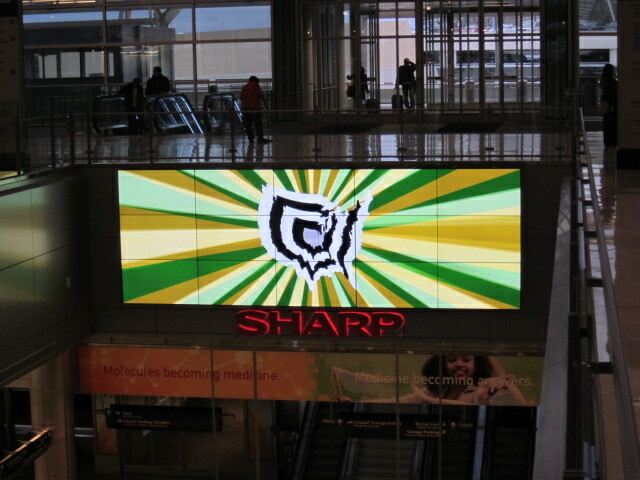 The power of suggestion on a big screen can encourage us to buy whatever flashes in front of our faces. For that very reason, sponsors are willing to pay a half million dollars for a momentary shot at our subconscious. Now that’s powerful stuff! I walked across the main lobby toward the escalators one year later, curious to see how the tense debate had turned out. 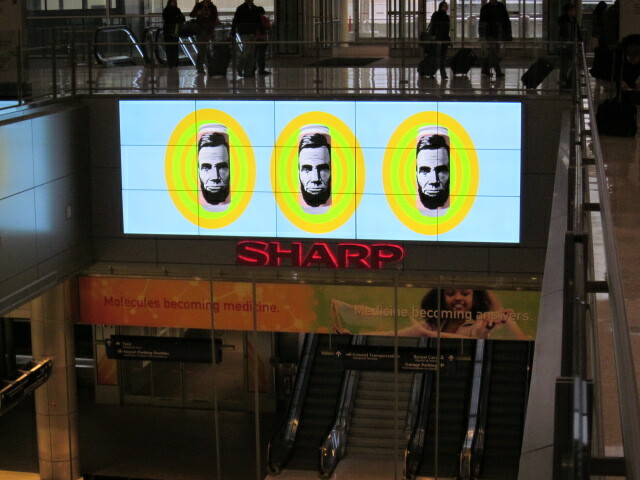 Sure enough, there in front of me was that disturbingly bright LED screen flashing its commands, as everyone stared obediently from their captive perch on the moving stairway—parading directly in front of the advertisers’ self-serving agenda. Of course, the beautiful sculpture had been removed (some say during the night) for obvious reasons, and relegated to a dark, unseen storage room, awaiting its fate. Unbelievable! Of course, the administration claims a win/win, since they’re interspersing so-called “electronic art” between the ads in an attempt to console art lovers. But the reality is that the only winners are the administrators who get to fluff-up their budgets and, most importantly, the advertisers who reap the benefits long after the bright lights have dimmed, and their messages are quietly embedded into our deepest desires. It definitely works, and that’s why they’re willing to fork over such big bucks. One thing for sure, they get to be very, very happy, because they’re going to be very, very rich! Oh . . . and by the way . 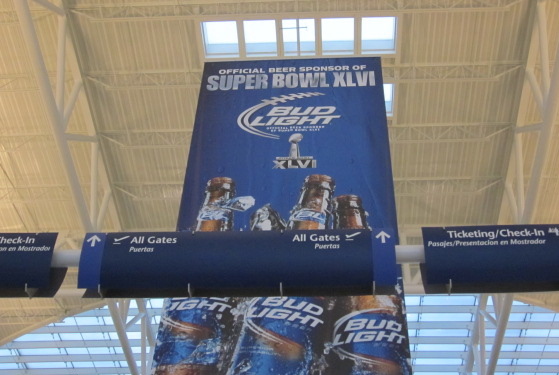 . . you might be interested to know that the screens were conveniently installed just in time for the arrival of the countless Super Bowl fans scheduled to flood into Indianapolis within a week of my departure. My guess is that the value of those flashing messages on that first week in February, is far greater than any of us can even imagine. But, what the heck . . . who needs art, reflection, peace and enlightenment when we can have the chance to follow someone else’s dream . . . all the way to their bank?